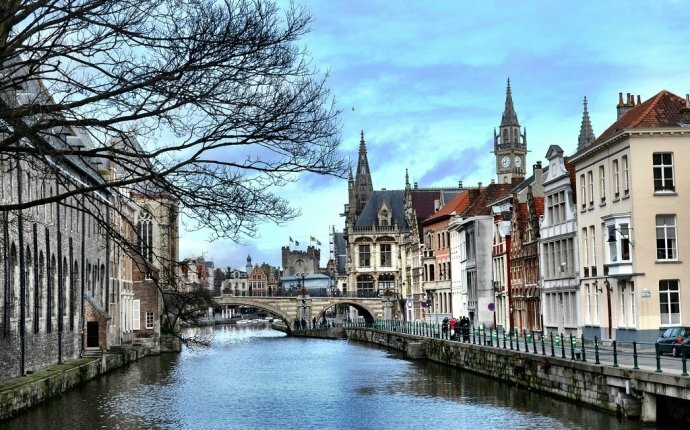 After a few days of cycling along a short stretch of the Canal du Midi last Easter, Mrs Bailey was surprisingly keen to take a short bicycle tour of Belgium or Holland this summer. I have to confess to being out of my comfort zone when I looked at the possible routes for this trip, but in the end she simply booked the Zeebrugge ferry, I booked the accommodation online, then we paid a few pounds extra to get the cycling maps just in time for our journey. As we left it, the ferry port of Hull was bathed in glorious sunshine, but after a sleepless night on a choppy sea we were greeted in Zeebrugge by strong winds and torrential rain, the worst, apparently, to have visited Belgium in quite some time. The worst of the weather had passed, but these canal paths were strewn with branches for much of their length. There was one other cyclist on the ferry, and we were among the first off into very heavy rain and wind. I completely missed the cycle lane (it was on our left) and rode up to two roundabouts. We were blown along in what seemed like the right direction. I stopped at the office of an estate agent to get my bearings and ask for directions. It was my fault really, but because I thought we would have to turn around and head back in to the bad weather I went south along the major route Baron De Maerelaan instead of turning left (east) at the same junction. Finally on Leopoldkanaal after a detour through Zwankendamme (and after cycling along the side of the busy Baron De Maerelaan), Lissewege and Dudzele. This is near orientation post 41 of Sportoena's cycle path network map 1B. Now we were on our planned route things got more straightforward. There were still some confusing signs that had us guessing and back-tracking a few times. It didn’t quite rain constantly, but the wind was in our faces all the way to Ghent. Mrs Bailey was less than chuffed. I tried to pitch the weather as a ‘cooling breeze’, but this interpretation was not well received. This was a hard ride for her. Some of the route along the canals are shared with motor vehicles. I think this was one of them. There was some respite from the weather. A member of the CTC’s forum had suggested that we visit Middleburg, but the rain was still bad enough to dampen our enthusiasm for sightseeing. We kept on going and endured rather than enjoyed this leg of our tour. No pictures of this historic city. We tried to avoid the rain by nipping in and out of shops on our way to taste a flavour of the local delicacies (okay, McDonald’s) and one or two beers.